◦ Major drivers of change versus Q3 2016: Distributions (-$8.8 billion), divestments of Claren Road and ESG (-$4.7 billion), foreign exchange impact (-$3.3 billion) and net redemptions (-$0.7 billion), partially offset by market appreciation (+$4.5 billion) and commitments, net of expired capital (+$1.8 billion). ◦ Total Dry Powder of $50.1 billion as of Q4 2016, comprised of $17.5 billion in Corporate Private Equity, $11.6 billion in Real Assets, $6.8 billion in Global Market Strategies and $14.3 billion in Investment Solutions. 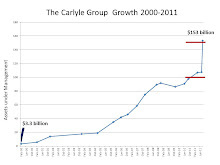 In Q1 2012 Carlyle had $159.2 billion in AUM. The high for the period was Q2 2014 at $202.7 billion. David Rubenstein: Fortunately, we are operating at a very favorable environment for the alternatives industry and for Carlyle. For our fund investors, asset prices and significant levels of distributions have increased demand to allocate even more capital to leading alternative asset managers. We are certainly poised to benefit from this environment and the risk of a near-term recession seems to have dissipated. Bill Conway: 2017 is shaping up to be a year of transition as we complete the investments cycle for several major funds, eventually move these funds and others into carry and raise the next generation of funds. Curt Buser: Total hedge fund AUM at the end of the third quarter was $5.2 billion and was zero at year-end, resulting in a decrease in assets under management. Fee earning assets under management is expected to grow again in 2018 after raising new capital and activating the related fees. Bill Conway: We need to make progress towards our goal of raising approximately $100 billion from 2016 to 2019. We raised about $14 billion in 2016 without many of the biggest funds in the market and we have a lot of work in front of us. David Rubenstein: On the fund raising, I would add just that there are two large groups that I may have mentioned before, are really dramatically increasing their amount of money that they are putting into private equity and not on other alternatives. There are the sovereign wealth funds which are dramatically growing in size and they are coming in in very large amounts in to our funds and other funds, our peers, and also high net worth individuals through feeder funds or through family offices directly. And we can see an explosion of interest from those two groups. Curt Buser: Fund raising costs will increase in 2017 given the larger amount of capital that we expect to raise and this will put pressure on fee related earnings in 2017 relative to 2016, since as you know, we generally expense all fund raising cost upon raising new capital. The merger market is being driven by large pools of private and corporate buyers, the wave of private capital combined with the abundance of available leverage at remarkably low rates has enabled private equity firms to pay big prices for companies that haven’t already been gobbled up by strategic buyers. In my opinion, the markets are priced for perfection, and they have been that way for quite some time, complacency reign supreme. However, my experience has shown me that this state of affairs won’t go on indefinitely. 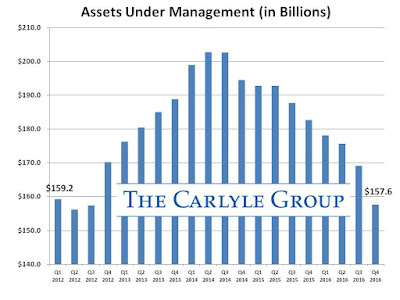 The Carlyle call included the state of affairs for Vermillion Asset Management, one of the "closed" hedge funds. David Rubenstein: We took a $100 million non-cash reserve last quarter related to these losses which principally revolve around the misappropriation by third parties of oil owned by various Vermillion investment vehicles. We are actively pursuing remedies to recover some or all of these losses but the amount and timing of recovery is uncertain. In the fourth quarter, we repurchased investor interest in one of the Vermillion vehicles, thereby resolving potential claims and acquiring rights to be reimbursed from future recoveries. 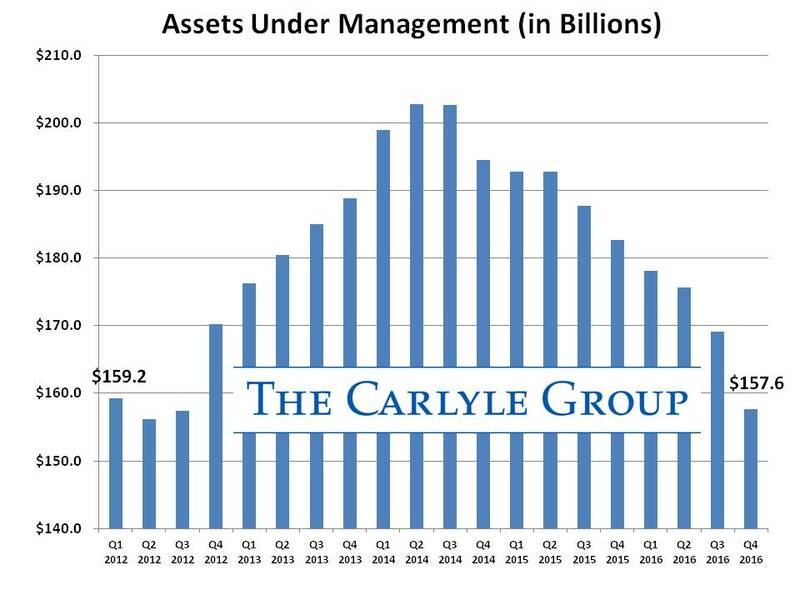 I'm sure Carlyle Capital Corporation (CCC) investors will be intrigued by by Rubenstein's comment that Carlyle repurchased investor interest to avoid a lawsuit. The CCC investor suit in Guernsey should be closer to a ruling or settlement. Oddly, the suit was financed by a Dutch billionaire who'd invested in CCC. How will the battle of the billionaires turn out?